DIY Doctor is joined today by Tony Cable who is spokesperson for NICEIC (National Inspection Council For Electrical Installation), the UK’s leading regulatory body for the electrical industry. He is going to answer questions about electrical safety. If your questions are not answered here you can look at our electrical projects on the main website, or you can ask questions in our DIY Forum. I have recently moved into a new house but I wanted to check the electrics are safe and up-to-date. Could you advise me on how to find a registered electrician? “When moving into a new home it can be very easy to get carried away with new furniture and decorating, but ensuring electrics are intact, safe and up-to-date is vital. Always remember alterations and additions to electrics need to be done before decorating. “To find a registered electrician in your area, I would recommend going to NICEIC.com, where you can find a register of approved electricians local to you. It’s always best to get a competent electrician to check over the electrics and make sure you ask the previous occupier to see any reports or certificates for any recent work carried out which will confirm the electrical installation has been tested and is safe to use. 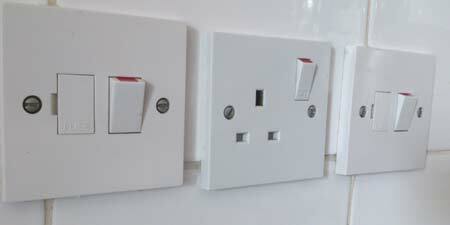 What should I ask a registered electrician before the work is carried out? “We always suggest homeowners should get two or three quotes for the work and ask the tradesperson to really spell out what is included in that quote. That way, both parties are aware of what work will be carried out and also the expected cost involved. If I wanted to carry out any electrical work in my home, what am I permitted to do? You can also watch a series of videos about domestic electrics, just click on the video below to see part 1.